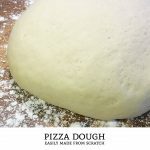 Make fresh pizza dough from scratch with this life-changing recipe. It’s the main ingredient for a great pizza, calzones, garlic knots, and a number of other delicious recipes. Mix water, honey, and olive oil in a bowl. Make sure the liquid is between 105℉ and 110℉ before lightly sprinkling the yeast on top. Wait 5 minutes until the yeast has bloomed and is frothy. Add 1 1/2 cups flour as well as the salt to the yeast mixture. Mix thoroughly. Keep adding flour in 1/4 cup increments until dough is smooth but still a little tacky. Form the dough into a ball, coat with a light layer of olive oil, and set into a large bowl. Cover bowl with plastic wrap and seal with a rubber band. Let the pizza dough rise until it has doubled in size (about 1 1/2 hours). Right before you’re ready to use it, knead it 1 or 2 more times and then it’s ready to be stretched and used in your favorite recipes.